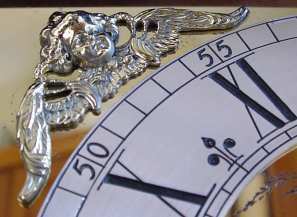 Engraved metal was the preferred material from the 18th century. Such dials were often decorated with applied spandrels and a separate chapter ring. Painted metal dials were often of tin. Being relatively cheap, they are typical of provincial clocks. These dials were popular between about 1780 and the early decades of the 19th century, largely replacing engraved metal. An alternative to paint was enamel. The chapter ring carries the numerals and minute markings. Engraved chapter rings are normally silvered. Calendar rings show the date through an aperture. The earliest hands on lantern clocks took the form of an arrowhead, with an oval centre or boss, and a long tail. The ears of the arrowhead evolved into loops, the boss became round and the tail shortened. These are decorative elements at the corners of the face. Cherubs are a typical motif.